Do you need Laptop Diagnostic? Is your laptop doing funny things? Is it not working like it should? Do you know something is wrong with it but can’t figure it out? 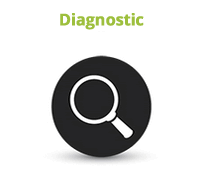 Let us diagnose the problem and tell you an estimated cost for repair. p>We are a true nationwide provider of Laptop Diagnostic, Laptop professional repair services as well as iPhone repair. Besides repairs at our Laptop diaservices, Laptop repair, PC Computers and laptop repair service center in Bellville Cape town, we have diagnosed Laptops for customers all over South Africa including Johannesburg, Pretoria, Durban, Kimberly, Bloemfontein, Port Elizabeth, Polokwane, Pietermaritzburg and Nelspruit plus many other South African cities. If you would like to use our professional Laptop repair services but don't live close to our Laptop repair service center, click here for information on sending us your Laptop for professional repair through our express courier service. The time it takes to diagnose your laptop can take anywhere from a few hours to a couple of days depending on the exact problem and our current workload. You will only be charged the diagnostic fee if you decide not to go ahead with the suggested repair or your laptop is deemed unrepairable.